Welcome to the fertile imagination of Frogman, Tim Cotterill, and his amazing collection of limited edition handcrafted, bronze sculptures. The frogs reach out, make us smile and remind us to find happiness and joy in life. 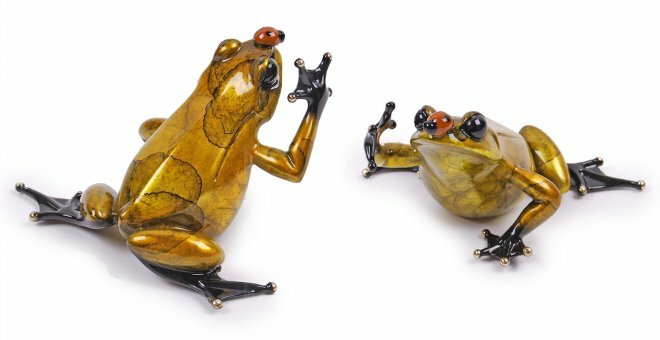 The frogs are incredibly heavy, cast in solid bronze. 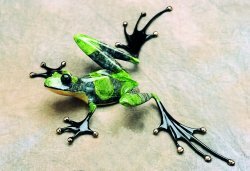 A six step process then creates the final jewel-like patina. They are all individually finished, all signed underneath and all have a world-wide limited edition number which is recorded underneath. 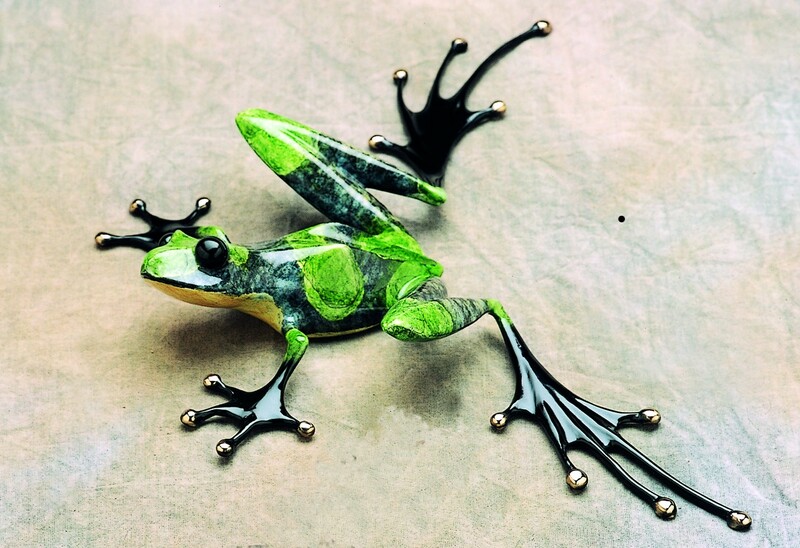 All frogs come with their own certificate, are signed and numbered. 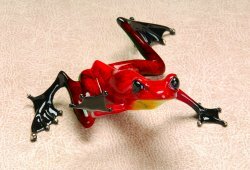 Below are some of the items in the Frogman collection that we currently have in stock. Description: Juliet is a newly created companion piece for Romeo. 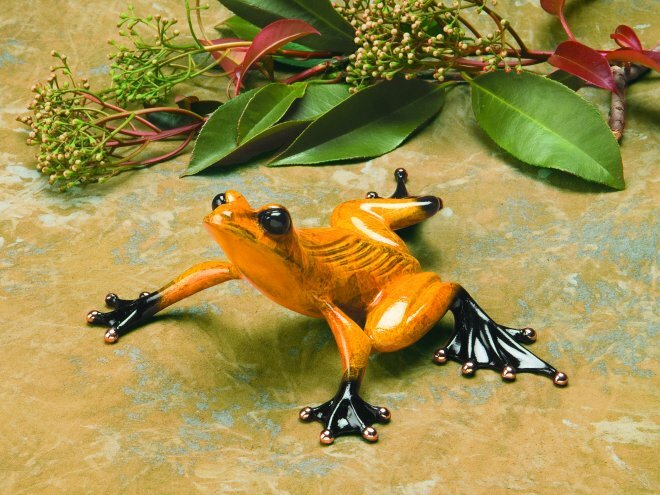 Juliet is wonderfully finished in a rich red-orange (with an area of flame-yellow) patina. 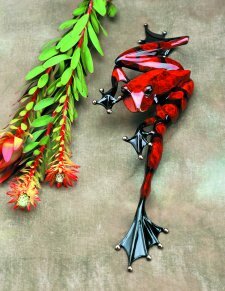 Size: (H) 2.25" x (W) 4" x (D) 4.5"
Description: This frog leans against a branch on which a caterpilar is climbing up! Her green patina has a wonderful shine. At the back of the branch two ladybirds are hiding. Size: (H) 18" x (W) 8.5" x (D) 6"
Description: She is all ready to attack and is watching you! Her red patina has a wonderful shine. 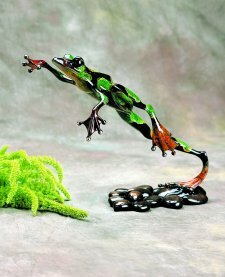 Size: (H) 3" x (W) 18" x (D) 6"
Description: He's in lovely brown shades and has quite an attitude. You've got his attention. Size: (H) 6.25" x (W) 5" x (D) 3"
Description: Dimples gets his name from the texture on his back. 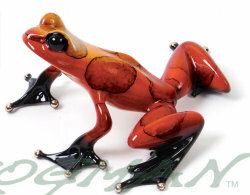 A very colourful frog in vibrant yellow and deep burnt red in the dimpled areas. He looks up at you with a wonderfully focused expression. Size: (H) 3" x (W) 6.25" x (D) 5"
Description: He has lots of attitude and with a gorgeous bright yellow patina he's not one to go unnoticed. 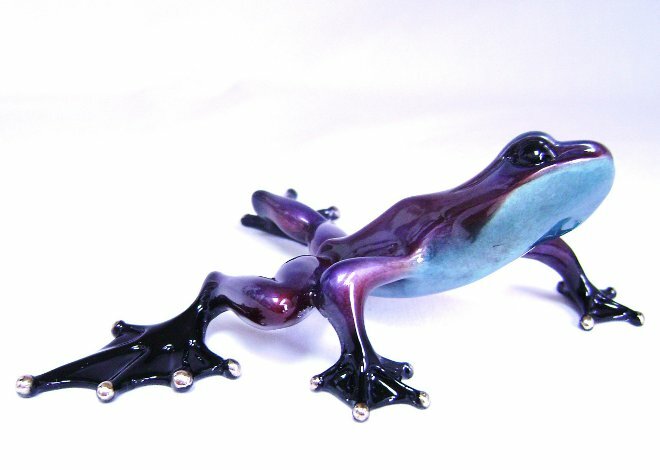 Size: (H) 5.75" x (W) 5.50" x (D) 2.25"
Description: We are thrilled to announce Persia as a new UK ONLY Spring 2010 frog! This is another first as this is a brand new patina for the UK only. 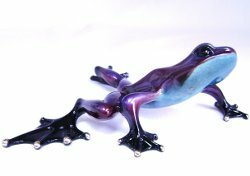 He is in glorious shades of rich purple, magenta and blue with the special silver nitrate finish that gives that amazing glow. Size: (H) 2" x (W) 5.75" x (D) 4.5"
Price: Sold out. Next page of listings has more available products. 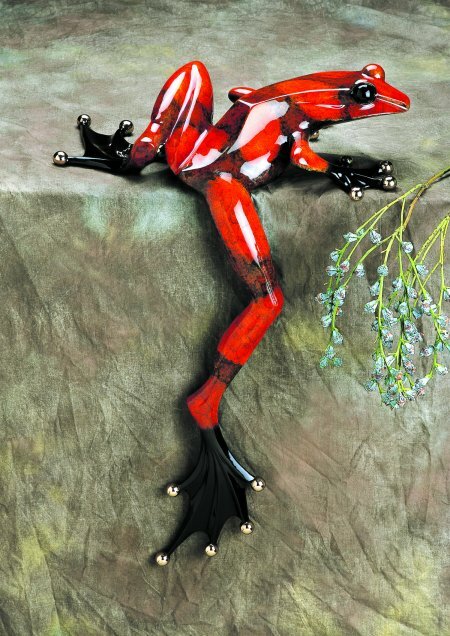 Description: The first ever UK Only Christmas Special Edition Frogman sculpture. 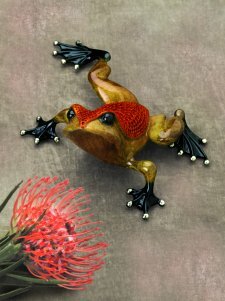 Inca is a festive frog for the festive season. He has a stunning rich deep gold patina with the silver nitrate glow in combination with a red cheeky ladybird to keep him company. This combination makes him just perfect as a Christmas gift. He is definitely going to be the Star of the Show. Size: (H) 4.25" x (W) 2.25" x (D) 3"
Description: Electra is a UK only edition. 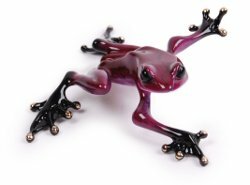 This gorgeous guy is finished in a completely new magenta shade patina which has never been seen before and we know he will be a knock out success. 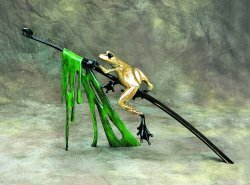 This is the show frog for 2009. 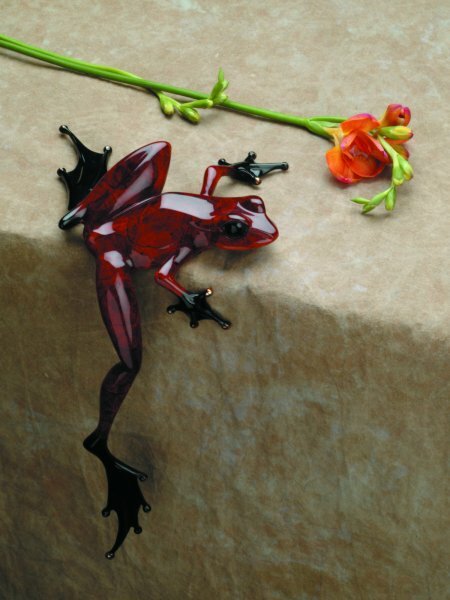 Size: (H) 1" x (W) 4" x (D) 3.5"
Description: Thinker, an elegant little hopper eyeing you thoughtfully. Solid bronze with a jewel-like finish. 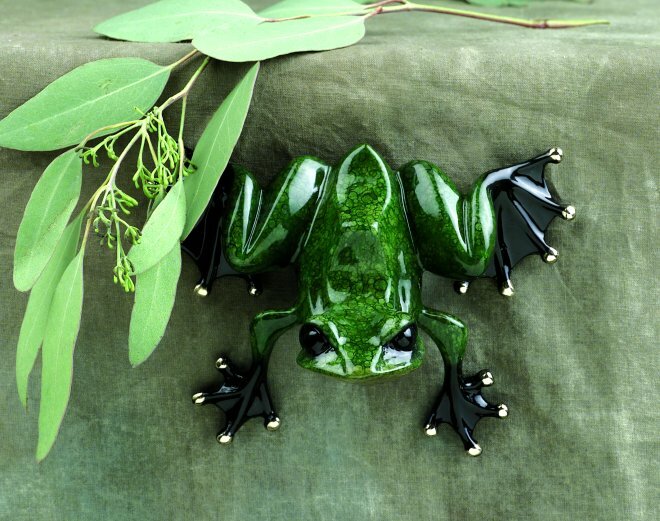 It has a wonderful green glaze. 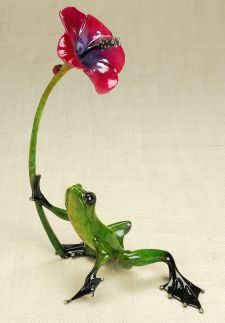 Size: (H) 2" x (W) 11.75" x (D) 9"
Description: A gorgeous little green frog at the stem of a pretty hibiscus flower. 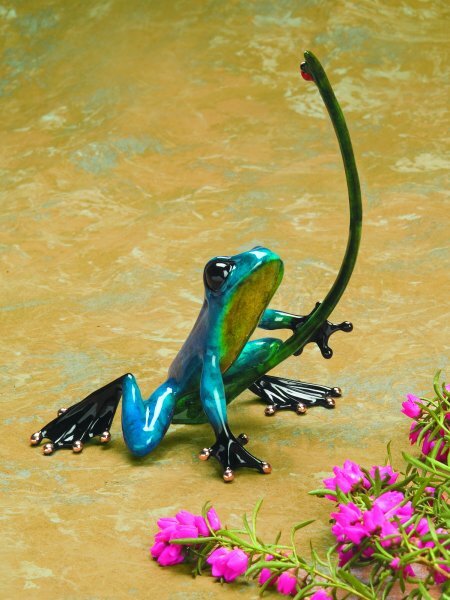 Size: (H) 11" x (W) 8" x (D) 5"
Description: This lively chap is full of passion. 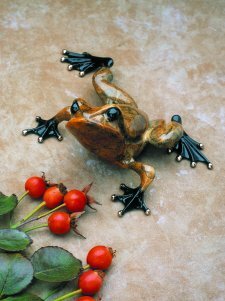 He's wonderfully finished in a rich velvet rose-red patina. 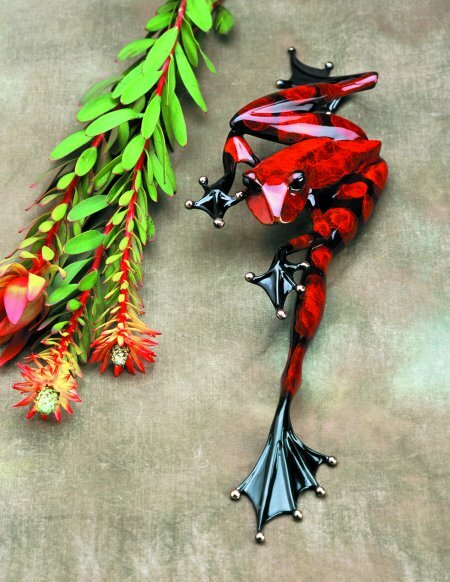 This piece is only sold paired with Juliet. Size: (H) 2.25" x (W) 6" x (D) 6"
Description: A stunning frog balancing on a branch. 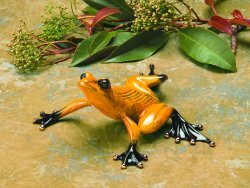 This is one of the larger pieces from the wonderful collection of bronze frogs. It never ceases to delight. Size: (H) 11" x (W) 18.5" x (D) 6"
Description: Leap Frog is a real 'eye-catcher'. 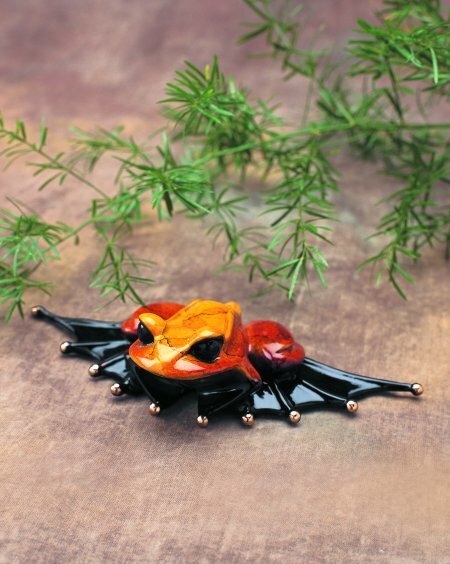 She leaps from a bunch of pebbles to reach for something she can only see. Size: (H) 9" x (W) 11" x (D) 5"
Description: Willie Jump is just one amazing sculpture. 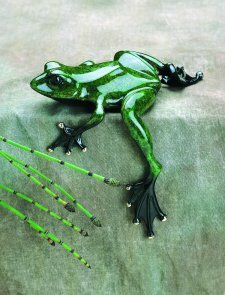 At two and a half feet in length downwards, he will create a 'wow' in any situation. Size: (H) 30" x (W) 20" x (D) 14"
Description: This classic green frog overhangs the table edge or shelf. 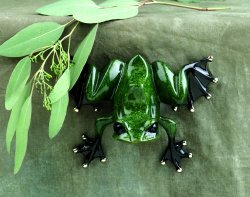 A lovely chunky frog just 'hanging about'! 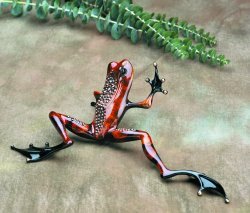 Size: (H) 5" x (W) 4.5" x (D) 5.5"
Description: A cheeky frog making a 'high five'. He has a most strking decoration along his back and has a bright unusual patina. 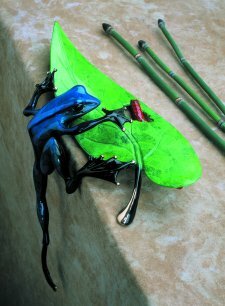 Size: (H) 12.5" x (W) 7" x (D) 4.5"
Description: This vivid bright blue frog is coming up over the edge as he stalks an insect on a leaf. 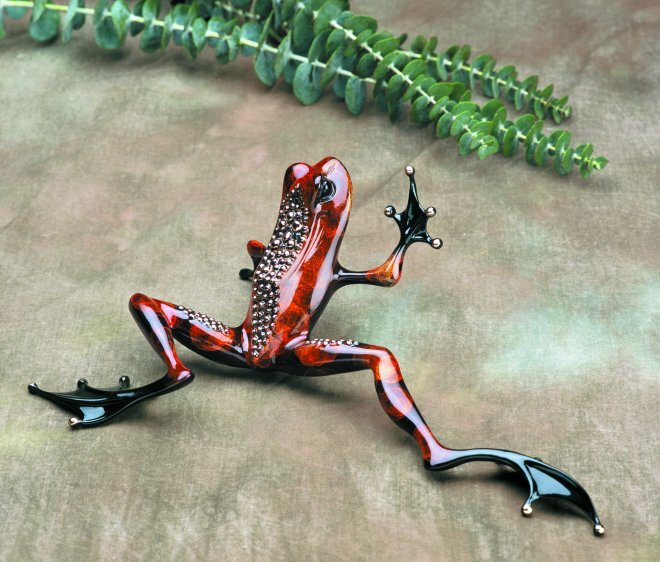 Size: (H) 10.25" x (W) 4.75" x (D) 10.25"
Description: This 'chunky' little chappy looks great hanging from the wall or sitting on the table. 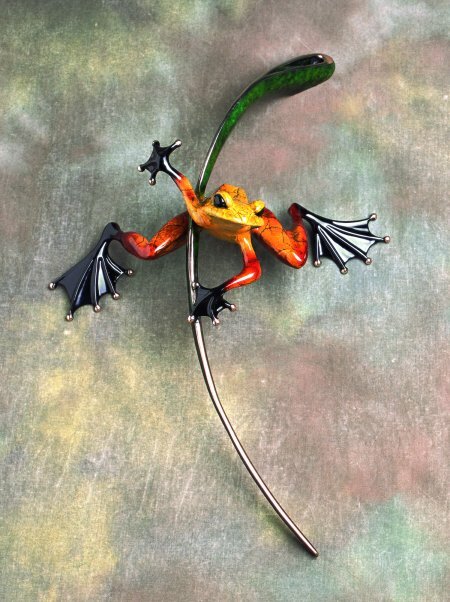 Size: (H) 3.75" x (W) 5" x (D) 2.5"
Description: Ready Set Go is a most striking sculpture from the Frogman, Tim Cotterill and is one of only a very few that is a wall hanging piece. Size: (H) 18" x (W) 12" x (D) 6"
Description: Flipper is a smaller chap but a welcome addition to any collection. 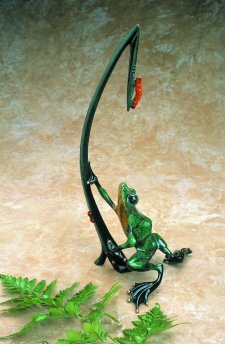 Size: (H) 6" x (W) 3" x (D) 1.5"
Size: (H) 8.75" x (W) 6" x (D) 5"
Description: This frog is reaching for a quick snack - a ladybug on a branch! He's a vivid blue with a green underside. Size: (H) 5.25" x (W) 5.50" x (D) 2.25"
Please send us a request to contact you using the message service on the Contact page or give Suki a call. Her phone number is on this page. Suki will be able to discuss your order and provide you with accurate pricing including postage and packing and insurance (if desired). You will then be able to make your payment via our Payment page on this site. Please phone me, Suki, to talk about any purchase you are interested in. Alternatively, use the Contact Us form and I'll phone you. Thanks. Follow the link below to make agreed payments. Thanks. Our showroom is open to visit by appointment. We are located in Gloucestershire - GL56.